Location: South shore of Lake Ponchartrain. 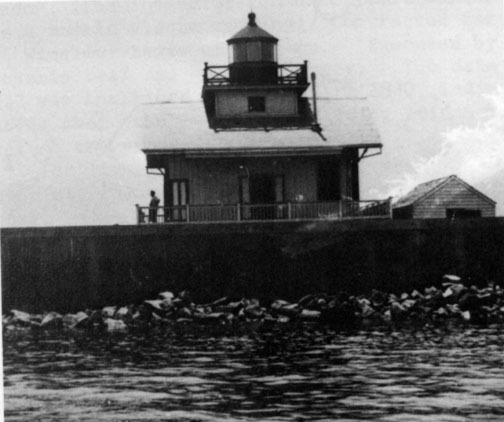 This lighthouse was deactivated after World War II. Vandals burned it down in the 1950s. Description of Tower: Lantern on roof of wooden dwelling, on brick piers. Optics: 1875: Fifth order Fresnel lens. An interesting "aside". When asked how to pronounce "Pointe Aux Herbes" I was told by a friend "That's wunnadem woids ya gotta be French to say, Mr. Lake! The best I can give it to you is as "Pwant oh-ehhbs"....but you have to say it like you are nauseated and sorta draw out the end like you're disgusted......! Sorry, that's the best I can do, but if you have a copy of the late, great Rev. Msgr. Jules O. Daigle, M.A., S.T.L. 's book, A Dictionary of the Cajun Language, he has a pronunciation guide in the introduction that is bar none! Lessee what he has to say about Pointe Aux Herbes......."oi as wa in wash", "au/aux as o in tote or note". "The letter "h" takes the aspirated sound as the English H in hair or high, but it is silent in such words as heure - hour, or herbe - grass. "